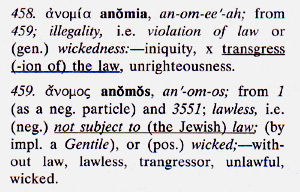 [John] 3:4) Yahweh’s Laws are given to us as a guide. They show us the way to Righteousness and how to have an Eternal position in Yahweh’s Kingdom. Salvation is shown throughout your bible to be given only to those who overcome sin and allow Yahweh to make him/her into Yahweh’s Likeness and Image.